MBARI’s remotely operated vehicle (ROV) Ventana completed its 4,000th dive on February 6, 2017. 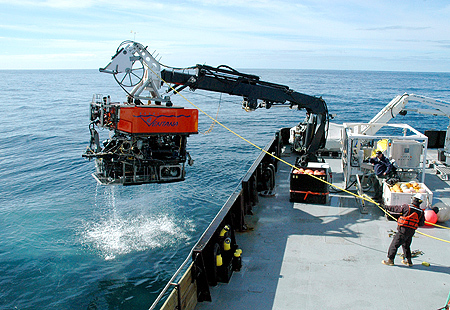 With over 16,000 hours underwater, Ventana is by far the most experienced scientific ROV in the world. 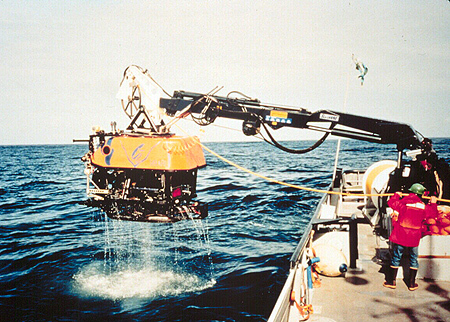 For almost 30 years, this underwater robot has given researchers a window into the depths of Monterey Bay. Although Ventana has seen many changes and technical upgrades over the last three decades, its success and longevity are primarily due to the dedication of the people who have operated and maintained it. 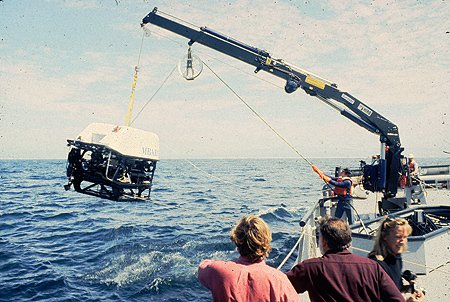 When MBARI first purchased ROV Ventana in 1988, the fledgling institute had barely gotten started. The first ROV pilots, Chris Grech and Jim McFarlane, had plenty of experience in operating and piloting undersea craft. But they had to develop all the ship-board routines for launching, recovering, and working on the cutting-edge ROV from scratch. By the late 1990s, Ventana had four pilots and a full-time technician, and was still doing 150 to 170 dives a year. 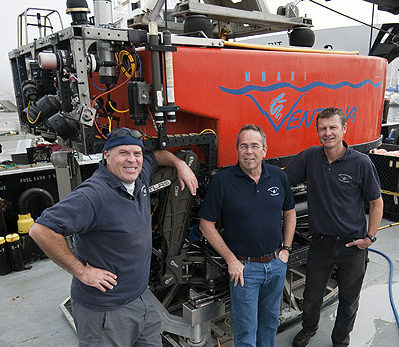 MBARI researchers had discovered that the ROV was not just a tool for exploring the deep sea, but also a platform for collecting lots of samples and conducting increasingly complicated underwater experiments. This meant that Ventana was being asked to carry heavy objects to and from the seafloor. Reflecting on all these changes and challenges, Dawe repeatedly talked about the key role played by ROV pilots. 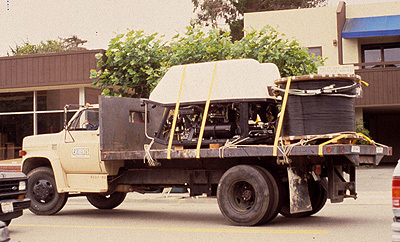 “For the most part it’s always been the pilots doing the maintenance and repair on the vehicle. The pilots also do any new design work. When we need to install new tools on the ROV, some get bought, but most are built in-house… and designed in-house, often by the ROV team, but also in conjunction with MBARI engineers and technicians. July 24, 2018 – A recent paper in ScienceRobotics describes a new bio-inspired sampling system that was tested using MBARI's remotely operated vehicle Ventana.